Dominos in Australia are promoting their barbecue chicken and bacon pizza with the Techno Chicken Dance. 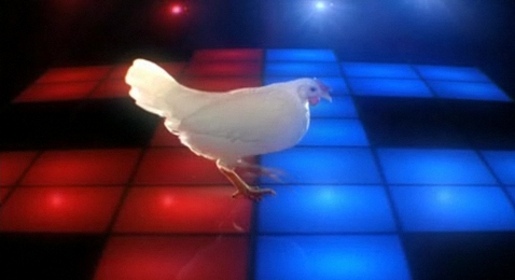 A chicken struts its stuff in the downtown disco, clucking to the groove. Tasty! All that’s missing is the pig to provide the bacon flavour. The Techno Chicken stunt was developed at The Campaign Palace Sydney by creatives Jon Burden and Georgia Arnott with agency producer Jacqui Gillies. Filming was shot by Luke Savage via Flying Fish, Auckland, with producer Anna Stuart and director of photography Duncan Cole. Post production was done at Perceptual Engineering with Puck Murphy on Flame and Rebekah Hay as producer. Sound was designed at Nylon Studios. More than 8 different chickens were used, trained by James Delaney and Caroline Girdlestone at Hero Animals (the team behind Babe and Black Sheep). None were harmed, although the crew did have chicken on the menu for lunch.